Watch boxes are the perfect gift for the watch collector or anyone man who could use a quality storage area for his jewelry and accessories. But with so many watch boxes on the market, how can you choose the right one? This quick guide will help you pick just the perfect storage case. The number of watches that the recipient has is probably the biggest factor in selecting the right watch box. For the serious collector, watch boxes are available that hold up to 24 watches. A more casual collector might prefer the more common 5 or 6 watch box holder. Watch boxes come in many different materials. The least expensive ones are made of faux-leather. If you can afford it, I’d recommend going with either a leather or a wood watch box – the material is just nicer and the boxes are of better quality. You’ll find a huge choice in wood watch boxes, including burlwood oak, mahogony, cherry, teakwood, maple and more. Consider what wood furnishings are already in the bedroom; you’ll probably want to choose a wood to match. An organized watch collector will probably enjoy viewing his watches through a glass top. However, the glass tops are a bit more difficult to clean. If the owner is going to store other accessories such as rings, necklaces, and bracelets in the box, you may want to consider a closed top box. Many, but not all, watch boxes can be personalized to create an heirloom. 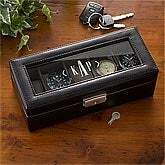 See-through watch boxes can frequently have intials or a name monogrammed on the top. Some wooden boxes have an option to add a plaque. When available, personalization is a great touch that crafts a truly unique gift. Costs vary considerably, depending on the size and materials used. Faux-leather watch boxes can be found for under $40. Larger boxes may run over $300. Watch boxes are perfect gifts for any watch collector. Paying attention to these points will help you choose the best watch box for any occasion. Shop our collection of heirloom-quality watch boxes today!